Provence has long been home to the most famous playground in France, though in vinous terms its reputation has rested on the vast quantities of mediocre plonk for the undiscerning drinker. Much of this consists of prettily bottled Côtes de Provence rosés, notorious for being high in alcohol while equally low in stature. This is a pity since this is the oldest wine-producing region in France, settled two and a half thousand years ago by Greeks who planted vines. Only in the last twenty or so years have enlightened producers begun to move away from this mediocrity. Although Vins de Pays and Vins de Table still account for most of the well over a hundred million liters produced each year, mostly from the high-yielding Carignan grape variety, much is changing for the better while even some of those rosés are becoming interesting. Of all the eight mutually distrusting Provencal appellations, Bandol, declared in 1941, has succeeded in making its name as the most highly rated with some hefty reds, well known for their fully-rounded herbaceous aroma. This is a relatively tiny area centered on a tourist-friendly port just to the east of Toulon, with just 1,400 hectares under vine. The pebbled clay soil is rusty red from its high content of iron oxide, while climatic conditions – hot summers and mild winters with the added bonus of sea cooling – are ideal for the fashionable if finicky Mourvedre grape. This grape not only has one of the longest maturing cycles of any variety, it also produces one of the lowest yields. In all, thirteen grapes are permitted, as well as Cabernet Sauvignon, which has begun to show its face here as almost everywhere else. Cinsault and Grenache are the usual ingredients in the blend, helping to offset the high tannins of Mourvedre. Bandol rosé, based on Cinsault grapes, is also much imbibed in the area. 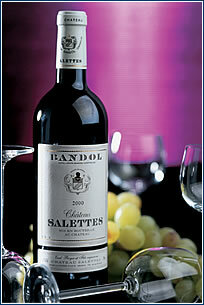 Structured reds with excellent tannins have aging ability of up to seven years. Those in the know need very little encouragement to seek out this small region’s very quaffable wines, thirteen of which are available in Prague. 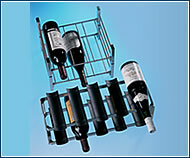 Store wines in decorative metal racks: 1. wire rack from Zack, expanded set for six bottles, CZK 1,738 2. stainless steel rack Tommy Larsen, set for 10 bottles, CZK 3,901. U svatého Vincenta, Liborova 13, Praha 6 – Břevnov (near hotel Pyramida, tram stop Marjánka). On January 16 at 7 pm, a tasting of Bulgarian wines and Bulgarian food specialties will take place in the vinotheque. Entrance 295 Kč. Entry level rosé from the cooperative which is the largest producer in Mont Caume, an area in the hills above Bandol. Salmon-pink in color, with a volatile flowery nose leading to a lively palate. This deep-tinted wine from the same producer is reminiscent of red berry fruits, typical of the predominant Mourvedre grape variety. A good rounded texture on the tongue added to generous helpings of herbaceousness. Grapes are hand-picked with temperature-controlled fermentation undergone in stainless steel. Clear straw hue and an elegant floral nose make way for a persistent taste of yellow fruits. Fine accompaniment to seafood. From the leading estate in Bandol, this strongly structured and scarlet-hued blockbuster has a complex spice-oriented bouquet and a sumptuous mouthfeel evolving into deep fruitiness with hints of rosemary and thyme. The finish is both persistent and long. If you can wait, this is wine to lay down.